Here at All Things Jabu, I am constantly looking to add quality to the blog for your reading pleasure. In the past few months I met Bianca “@BtheBumbleBee” Bouwer and her passion for Formula 1 was immediately infectious. As a result I asked if she would be willing to write a piece on all things formula 1 after each race. She agreed and with that the I introduce you to our new column, “The Pit Wall”. So here we are. It’s Monday, and I’m talking F1. If you check back the Monday after each race, you’ll find me here dishing out the good, the bad, and the ugly on the past weekend’s Formula One action. All Things Jabu seems to think I know my stuff, and I’m all too happy to oblige and share my enthusiasm with you all. Let’s start with a recap of the season so far. Australia saw Kimi with a ‘pretty easy win’ as he put it. The first race of the season always brings with it much excitement, however the race didn’t yield any significant events. What I’d really like to talk about is the most awkward press conference in my Formula One watching history. Yes, you’re thinking of Malaysia. Team-mate wars were on fire with both the Vettel/Webber and Hamilton/Rosberg battles igniting during the last laps of the race. Those moments before and after the podium celebrations made me cringe in my seat. A clearly furious Webber promptly ignored Vettel, and when he finally spoke, the phrase ‘Multi 21’ was repeated. We assume that this is team code for holding position. That or Mark was admitting he didn’t take his multi-vitamin that morning – his only real chance of overtaking Seb. Ok sure, let’s get the facts straight. Yes, Seb didn’t obey team orders. Yes, it was cocky of him to overtake Mark and put both of them in jeopardy. But last time I checked we were watching racing, not which team can execute the most efficient orders upon their drivers. We can argue backwards and forth about Mark obeying team orders and turning down his engine, hence why Seb was faster, but the real issue for me here, is why are there still team orders? I still remember the 2002 Austrian GP where Barrichello was ordered to move aside for Michael Schumacher to secure the championship. That made me feel sick, and you could see on Michael’s face that he didn’t like it either. So if Webber wants to win races by letting the team hand it to him on a silver platter and not racing for it like a champ, then he doesn’t deserved to be classified as a F1 driver. There is definitely some serious rivalry afoot in Red Bull, and speculation is that Seb’s move on Webber was ‘revenge’ for the 2012 Brazilian GP, where Webber pushed Vettel out to the side at the start of the race, forcing him back and letting a number of middle order cars through. This move put Vettel’s championship in jeopardy, and I’m sure it has something to do with the Malaysian move on Webber. On the total other end of the spectrum you have Nico and Hamilton, both adhering to team orders. Nico clearly also wasn’t happy with the orders from Ross Brawn, but was less vocal about it, settling for a calm ‘remember this one’ to his team over the radio. For me though the day’s entertainment came from Lewis pulling into the McLaren team pits and him admitting he ‘did a Jenson’. I guess old habits die hard. Heading on straight to China, where Mark’s ‘bad luck’ just seemed to get worse for the poor lad. Quirky headlines of ‘wheel my bad luck ever end’ had me chuckling. Everything seems to be coming undone for poor Mark, even his tyres. The Aussie lost his right rear on lap 17 as it just seemed to slip off. And to make matters worse he incurred a 3 place grid penalty for the next race after crashing into sister team, Toro Rosso’s, Jean-Eric Vergne. These team-mate wars sure do make for interesting viewing because in F1, the first person you have to beat is your team-mate. Bahrain didn’t disappoint, with Button and Perez having a go at each other when Martin Whitmarsh had told Perez after China to ‘get aggressive’. This sure did light a flame under the seat of Perez, with the Mexican going wheel to wheel with his team-mate. McLaren have no team orders and it was rather refreshing to watch some real racing for a change. Perez tried to take back position from a reluctant Button, which in turn caused Perez to drive right up into Button’s gearbox in turn 4, luckily not slashing his team-mate’s tyre upon impact. Is it just me or did it seem like Button lifted out of that corner to make Perez slam into him? Naturally a couple of seconds later old Button was on the team radio moaning. This constant moaning seems to be an annoying personality trait, and there was a fun poll on Planet F1 about a week ago that made me laugh. The question was whether Perez’s driving style is reckless, and the poll answer that was far in the lead when I voted was ‘Button must just stop moaning’, which I thought was rather funny. It’s a household joke that when we see the team radio for Button appear on the screen that we anticipate a Moaning Myrtle moment. Let’s get going on yesterday’s race – 22 cars lined up on the 37C track ready to charge down to the first corner. Vettel pounced on Hamilton when a wheel lock caused him to brake late, with Vettel nabbing P2 off him. But the real winner was Fernando Alonso, who went round the outside in a bold move to overtake both Raikkonen as well as Hamilton. Up to P3 on the first lap, the rest of the race seemed a piece of cake for Ferrari, who were clearly the team of the day. 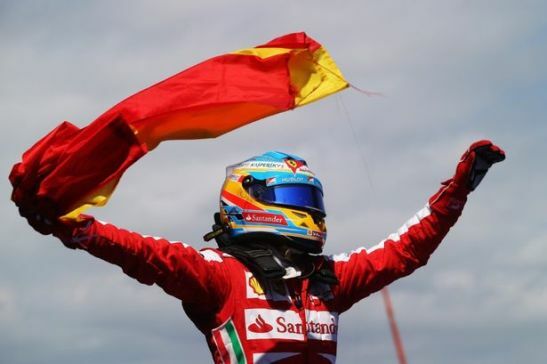 Alonso went on to win his home Grand Prix, his first for Ferrari. On to the biggest losers of the day, which had to be Mercedes. The car did not handle the track very well in terms of tyres, seeing Rosberg and Hamilton being picked off one by one by cars coming through. Hamilton’s frustration was evident in his remark of “Now I’ve been overtaken by a Williams,” I had to feel sorry for the chap. Formula One has become somewhat frustrating for us die hard fans as more and more we are seeing tyre degradation becoming one of the sole determining factors of the race outcome. Sure tyre degradation is part of the sport and you need to manage and look after the rubber, but we are increasingly seeing an entire team’s performance being halted by the controversial Pirelli tyres. Sebastian Vettel later in a press conference said that, “When you are telling drivers not to push because we are saving tyres isn’t great for the sport or for the fans. We need to push the drivers harder and allow them to drive properly.” But let’s debate about tyres in another post. Happy Monday all, have a great week.